Today I had the pleasure to interview Dr. Paul Marik, Professor and Division Chief of Pulmonary Critical Care at Eastern Virginia Medical Center. We got to speak on the topic of fluid responsiveness–one of the toughest questions in critical care. What is Passive Leg Raising? For a brief period of time, a bolus of fluid is sent to the heart, allowing you to test fluid responsiveness without doing anything permanent to the patient's fluid status. What is the Monitor that Dr. Marik mentioned? 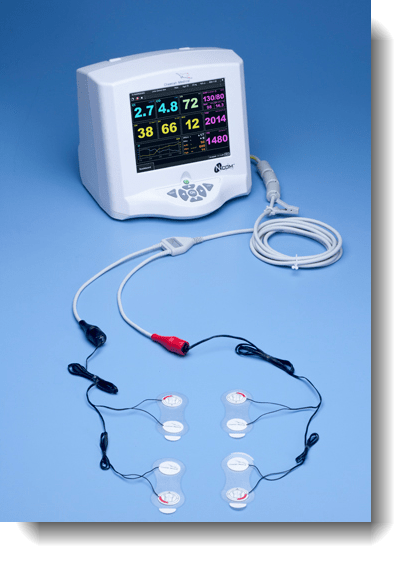 The NICOM Monitor by Cheetah Med uses bio-reactance to yield cardiac output/stroke volume non-invasively. I have been trialing the monitor and have been very impressed so far. It is inexpensive and correlates with my echocardiograms. Neither Dr. Marik nor I have any Conflicts of Interest! Scott Weingart. Podcast 64 – Fluid Responsiveness with Dr. Paul Marik. EMCrit Blog. Published on January 8, 2012. Accessed on April 22nd 2019. Available at [https://emcrit.org/emcrit/fluid-responsiveness-with-dr-paul-marik/ ]. I noticed the technology used in the NICOM product runs a small current through the patient at radio frequencies (not sure if it is low-frequency or high-frequency). Does this interfere with the surface ECGs or do the standard monitor-mode filters work fine? Profound stuff! Keep it up. My service looked into one of these non invasive CO monitors using doppler USS. a few years ago and nothing ever came of it as the evidence at the time was not so convincing. It seems things have matured. prehospital CO measurement…now thats an exciting concept!will chase this up again with my retrieval colleagues! Going back to transport medicine and going to work in fixe wing and with clinic with low budget and not much technology, what will be my best approach to assess my patient? Been a nurse I may not have access to arterial line unless someone can place them. Hand-held ultrasound is how I would go for transport. What monitors do you guys run? The Phillips MP line does PPV (aka SVV) out of the box (at least the MP50, 70 and 90’s I play with, not sure about the MP30), so if you have a medium sick patient who you don’t feel like putting a Vigeleo on (I assume it’s a Vigeleo), you can set it up and it spits out a number at you, no fiddling with another machine or otherwise interrupting your workflow; enable it, wait ~30 seconds, and get a number. I use PiCCO and Vigeleo a fair bit, but it can be tough convincing other people that they improve outcomes given there doesn’t appear to be much evidence at all when it comes to ICU patients. The NICOM monitor looks very interesting, although I think it could be tough to convince people it gives real numbers; a lot of people still scoff at the numbers that a PiCCO thermodilution gives you. Got a bit worried when he started talking noninvasive! We trialled a bioimpedance device about 7-8 years ago and were way less than impressed. I’ve often wondered why more people don’t use the simplest tests, 500cc bolus or passive leg raise. Dr. Marik shows remarkable common sense. Scott, thank you for this amazing blog. Besides tons of useful information it’s a great source of inspiration. Just want to ask what you think of dr Lichtenstein’s protocol where you give fluid till you get the “wet” pattern on lung ultrasound (predominant B-lines)? It’s extremely simple so nice in the ED/non-ICU ward, and you get to see what actually happens in the organ most sensitive to fluid overload. Even SV must be a surrogate parameter in a sense? in performing the passive leg raise—how long do you wait before rechecking the blood pressure? what are you using as your stroke volume surrogate?–systolic, diastolic, or MAP? I assume we are looking at a greater than 10% increase as being indicative of “fluid responsive”. This seems imprecise without an A-line but you say simple non-invasive BP measurement can work? Intermittent blood pressure will not work. For an a-line I think a 10% increase in MAP or SBP is a reasonable positive. But if negative, it doesn’t mean the patient is not fluid responsive. If the result is negative durante the PLR.. should that repeated.. or give the patients medication (inotropics, etc)? If negative, use pressors or inotropes; recheck for fluid responsiveness in a bit. I appreciate the perspective of Dr. Marik, and it was an interesting discussion. It was somewhat frustrating to hear, though, to hear the empiric data for septic shock dismissed out of hand. I would tend to agree about the accuracy of CVP as an isolated measurement of fluid responsiveness, no argument there. However, whatever the limitations of the Rivers trial, it gave us actual outcomes, an NNT for mortality. You can’t ignore the fact that it did so, in part, by using the CVP to guide therapy. Sure, there may have been some clinicians who applied the results of EGDT in a rote, unthinking fashion – “6 liters in the first 6 hours” – but it seems like Dr. Marik used that characterization to invalidate the application of the study’s results, setting up a “straw-man” argument. Is there any comparable outcomes-based research using the NICCOM or similar) devices? Brooks, Thanks for the comment. I can’t say I agree with you. One thing the EGDT trial did not show at all is any value to CVP per se. Both groups got CVP monitoring and both groups had the same CVP goal. I believe Dr. Marik’s comment re: empiric fluid admin was less a commentary on Rivers’ trial than the ongoing PROCESS trial in which empiric fluid admin without a marker is considered a good idea. keep on with this cast. Fantastic podcast! I’ve been waiting a while for this one. I have a couple of quick questions though. First, is there any data out there on whether sonographic parameters like IVC collapse or LV diastolic function (like the ultrasound podcast guys suggest) correlate w/ fluid responsiveness vs just static measures like CVP OR PAOP? Second, and this is just a random thought I had, but what about using a continuous ScVO2 monitor in lieu of the SV monitor in the algorithm above to see if DO2 is increased w/ the fluid challenge? IVC with mech vent has shown fluid responsiveness; spont resp–nope. ScvO2 and SvO2 has been used for this purpose (and to decide who needs blood transfusions as well). It is a bit downstream though, and doesn’t measure regional improvements in perfusion. Does anyone have any experience with the NICOM in the pediatric population? Are there any studies supporting the use of this monitor in pediatrics? Assume we are talking about tubed pts on mech vent. In this case, IVC is really resp-dynamic CVP which nobody has looked at and probably would be quite good as opposed to static CVP. What we can say is that we have a bunch of studies on IVC in thsi group and it seems to towk nicely. How can the CVP be a the devil and the IVC be wonderful. They are looking at the same vessels! I know CVP is pressure and IVC is volume. Is it possible to have a high CVP with a full collapse and possitve IVC exam? Please explain! Paul, In this case, I assume we are talking spont vent pts. Static CVP may be the devil for fluid responsiveness, but not tolerance. Dynamic CVP may be that much better. IVC in the way I advocate is dynamic and used for tolerance; for this it is pretty good. Is there a pocket sized US machine that is a reasonable cost? It would be great to see an adapter for a phone of tablet device to allow one to reasonably assess fluid responsiveness ASAP especially in HEMS. Or even better perform a FAST in the field to discover what you don’t know yet but will discover as VS decrease. I was not yet impressed with the ones I have found. Write the ultrasoundpodcast.com guys on their site as they have access to the cutting edge devices. hey scott, you mention the NICOM is inexpensive. Can you give me a rough ball park figure re cost? I know that it will vary between countries/hospitals etc but just a ball park would be great. Our shop has been using the NICOM’s now for about 1 year. I have had mixed feelings about them. I am actually going to be giving an informal lecture to residents and looked at a lot of the data. Although it all looks great on paper, in my experience I have issue with the CO/CI readings. I feel can be quite inaccurate. I have actually had cardiologists come and calculate CO and it was way off. This is usually in those with severe HF (which correlates to some of the literature) but I feel its these patients where it is most important to know their volume responsiveness. Any thoughts on that or anecdotes? Thanks! scott what would bp rise be by nibp for use as tool in prehospital related to sv ? Please note that Dr. Marik has received money for lectures from Cheetah. I think this should be noted in the COI and in the interpretation of his reviews and thinking. HI I too was wondering about this. Typically an objective source would not recommend a modality. Do you have any examples of $ for lectures, he says he has no conflict of interests.